This last Christmas, my younger brother (who also happens to be the chief proprietor of this website) schemed a clever idea for his Christmas wish-list, which would ultimately come to involve me to a great extent. He sought out a Famicom on eBay, as well as a lot purchase of Japanese games — about 110, if memory serves. He did the same in procuring a Super Famicom, meaning that after the somewhat grueling process of setting it all up (while the Super Famicom was a cinch, our lack of a North American RF switch, and an RF compatible TV, was a thorn in the side) we had hours of video game exploration ahead. What games would be in that enormous box? Some we’d recognize from American release, perhaps, but surely there’d also some peculiar, Japanese-only games that we likely wouldn’t have experienced otherwise. Despite myriad logistical troubles, the endgame played out precisely as he’d expected. Namely, sitting down in front of a large box, perilously reeking of dust for something containing cartridges nearly a quarter-century old, and plugging them in to see what curiosities awaited. And it was no disappointment, although the strangest and most culturally remote finds relied heavily on Japanese text (a plethora of corporate business simulations and so-called “sound novels” in particular), rendering them largely unplayable to us. 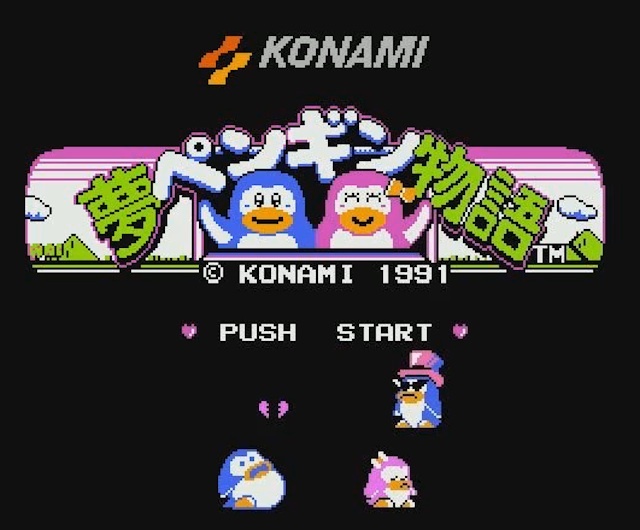 One such unique find, which in all truth I identified as a prime target for this review after a mere two minutes of play, is Penguin Dream Story (夢ペンギン物語). 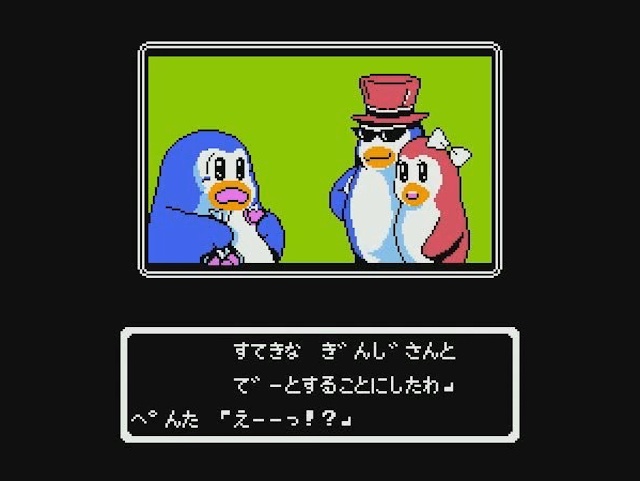 You take the role of portly penguin protagonist Penta (likely a reference to, if not in fact the same character as Pentarou, a Konami hero of other titles like Antarctic Adventure and Penguin Adventure), who is in love with a demure, pink penguin named Penko. Their relationship is on the outs, however, presumably thanks to Penta’s lack of self-restraint — he’s become morbidly obese, and Penko, however much love may have passed between them, no longer finds herself attracted. Consequently, Penta is dumped, left to wallow in his sadness and wounded self-esteem, a dangerous mix for a fellow who appears to be in the throes of an eating disorder. However, making the choice to persevere, no doubt a hard one in the face of his abysmal physical condition and heartbreak, Penta sets about on a journey to win her back. Penko begins dating a slimmer, slicker, sinister looking penguin name Ginji, adorned with a top hat and sunglasses, and possessed of an uncompromising plot to stymie any attempt by Penta to reunite with his old paramour. He dispatches minions throughout seven different levels Penta must overcome, and arms them with an array of foods. As you play through each level, enemies are constantly hurling snacks at you, and if you suffer a hit, guess what — your weight-loss quest will be sorely compromised. Also scattered throughout the levels are diet drinks, in pink and purple bottles, which burn off incremental amounts of Penta’s girth with each chug. 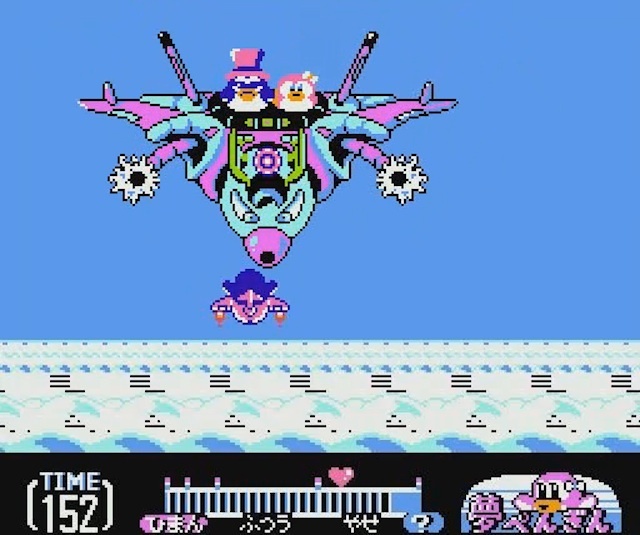 As such, the gameplay in Penguin Dream Story is atypical. The mechanics are by and large those of the generic platformer, to be sure, but the way Penta advances through each level is unique. There is no life bar to speak of, as his enemies aren’t trying to kill him, but rather keep him obese enough to repulse Penko. When you begin the first level, you are at peak fat, so to speak. Penta is so heavy and staggering that he has no athleticism, and progressing along is difficult, as his only attack is a short jump into the air, followed by a clumsy belly flop that can crush anybody he lands on. As he nabs diet drinks and begins to slim down (a fitness bar below the screen highlights both your current weight and where it must be at the level’s end), his condition improves. In his moderately fit phase, he can jump higher, move faster and dispatch foes with deft physical attacks. Should you actually return him to prime fighting form, he becomes stronger still, gaining the ability to shoot lasers from his eyes (which I can only assume were previously compromised by some form of prediabetic nerve damage). Just above the fitness bar sits a symbol of a broken heart, denoting the threshold of fitness Penta must cross before finishing each level. If you make it through, even beating the boss, but are still too fat, you must go back and try again, since your fighting spirit wasn’t what Penko had the problem with, but rather your outward appearance. 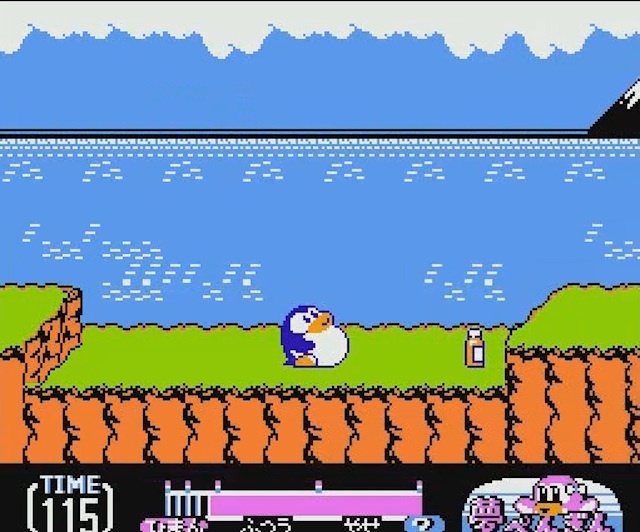 In each successive level the task becomes a bit harder, especially against Ginji’s nefarious plot, working ceaselessly to cram food down your throat and rob you of the svelte penguin form. This plays out over the course of seven levels, culminating in a aerial showdown with Ginji himself. If you manage to defeat your hatred romantic rival while keeping the pounds off, your dream will be realized — a remade body, and a reunion with Penko, now smitten with your dashing figure, though in fairness Ginji was still the snappier dresser. As the credits roll, the pair share a loving moment sitting underneath a tree at night, taking solace in each other’s affections. Until Penta looks over, startled, to see that Penko is now herself binge-eating, and has become obese. It’s rather hard to parse my feelings on the message of this game, such as it is. On the one hand, it portrays characters with a somewhat superficial, highly transactional view of love and romance, though not an entirely unrealistic one. Partners in relationships who undergo dramatic weight gain can indeed no longer be attractive in relationship, and it wouldn’t be fair to judge someone harshly for that reaction — attraction can be, obviously, a conditional and opaque thing, and who’s to say what sparks or diffuses it? Penko’s decision to leave Penta, while perhaps hurtful to him, is certainly her right, as it is her right to start dating somebody new. And Penta’s subsequent quest to round himself back into shape is a heartening one, and significant insofar as protagonists struggling with obesity or body-image issues are few and far between, even more so back then. However, the way the game demonstrates his mission of self-improvement is rather short-sighted, and dangerous from a health perspective. The solution to obesity, surely, is not to avoid eating any food while guzzling diet drinks, whatever those are (as the former assistant manager of a bustling local gym, I became quite familiar with, and dubious of many such products). Nor is it necessarily the best motivational posture to hinge one’s health interests to romantic affections toward a spurning lover, since it’s certainly no given that Penko would take Penta back, after settling in with a new boyfriend she might admire in other, deeper ways. But the pathos of Penta, which serves as the driving force of the game, is undeniably strange, unique, and puts you in a role of vulnerability uncommon in video games. And it does, even if its prescription for positive change is highly suspect, advocate the idea that perseverance and self-respect can lead to a radical change in health and quality of life. The mere experience of playing the different stages of Penta’s fitness, from lumbering and staggering to quick and nimble, speak to that theme quite evocatively. All that said, you may have noticed I haven’t once mentioned the graphics or music, which I typically do. That’s because they’re wholly forgettable, with the lone exception of Penta himself, who displays an impressive variety of expressions and emotions despite his extremely simple, rudimentary sprite. But in all honesty, this isn’t a game that demands visual virtuosity, or a stirring score. Just spending some quality time trying to help your homeboy Penta (and not much time to boot — I beat the game in a little over thirty minutes) is satisfaction enough.